Today we are going to feature something a bit different. 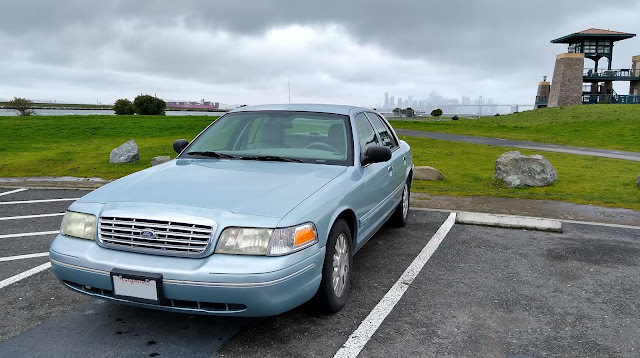 My car, a 2005 Crown Victoria was due for a brake job. When braking, I would experience some vibration coming through the brake pedal upon being compressed. It wasn't a serious issue, but it had to be fixed eventually. 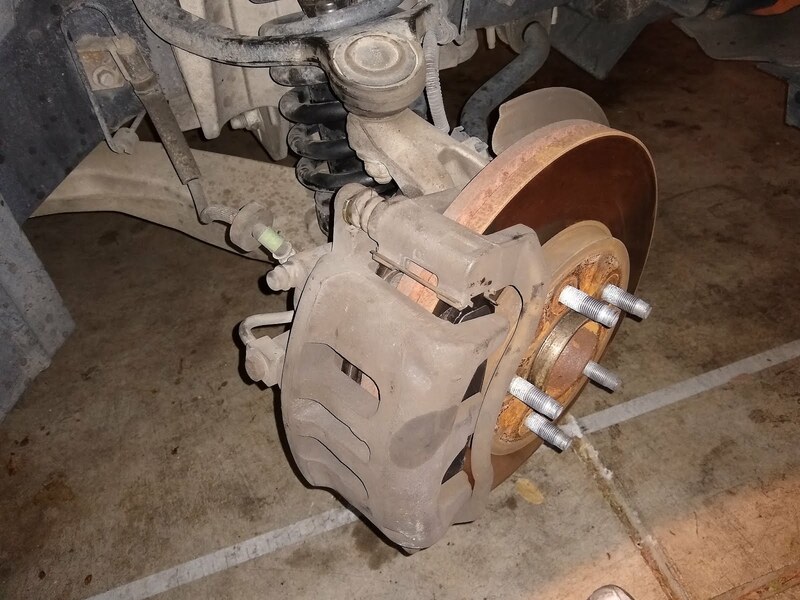 In the past, I had done a brake job on my other car so this was not going to be my first rodeo. 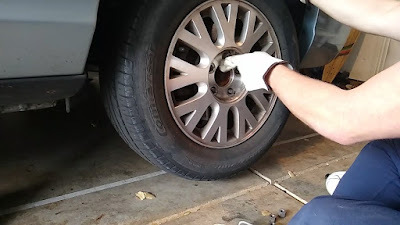 I had been procrastinating on doing this task for a while, but after helping out a friend with his car earlier in the same day, I decided to stop by AutoZone to rent a torque wrench to get the job done. I figure it was a good day to do the front pads and rotors and thought it shouldn't take too long, right? Getting into it, using my breaker bar and 13/16" in socket, I was able to muscle off the wheel of the right tire. Off to a good start. 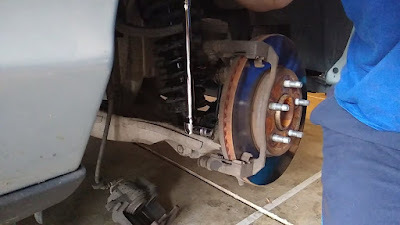 Then I went to remove the 14mm bolts holding the caliper pins in place. 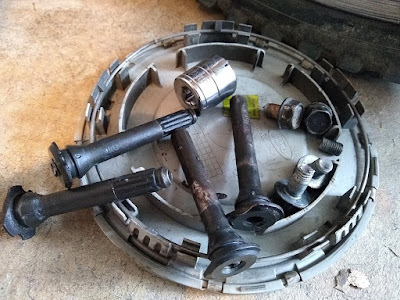 I was struggling quite a bit turning my wrench to remove these bolts. Then all of a sudden the first bolt snapped off. Uh oh, that's no good. At this point I was panicking internally, with all these different thoughts in my mind. "What if I was not able to fix this?" "Will I be able to drive this car tonight.... or ever?" 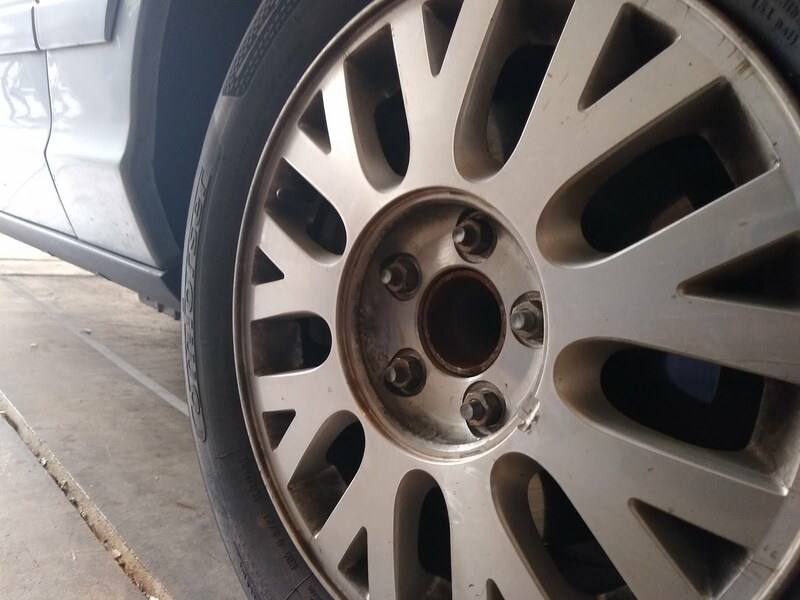 "Is this car going to forever rot in my garage?" I had to push forward and figure out how much those pins cost and if they could be replaced easily. 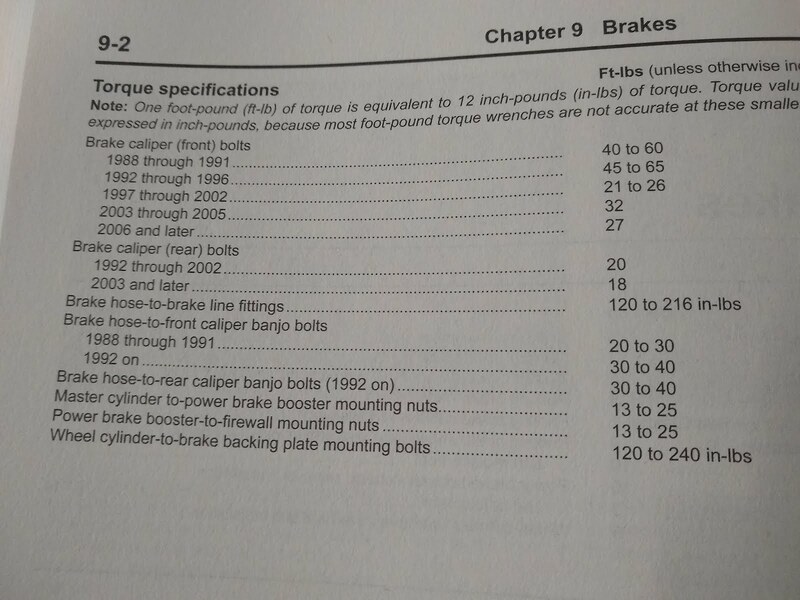 Onto the second caliper bolt and that one broke too. Fortunately, after some quick research, I figured out that these bolts and slide pins are rather cheap, so I'd be able to order a pair later. Next I was able to slide off the caliper and take a look at the old pads. 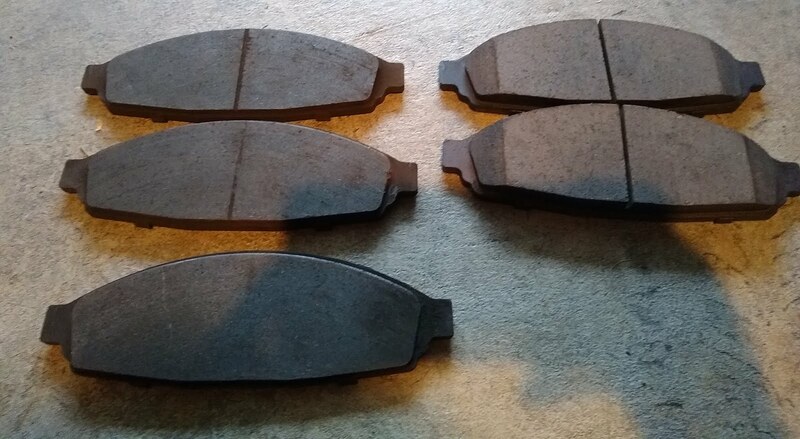 There was some life left in them, but they were unevenly worn compared to the pads I pulled from the other wheel (which I will discuss soon). 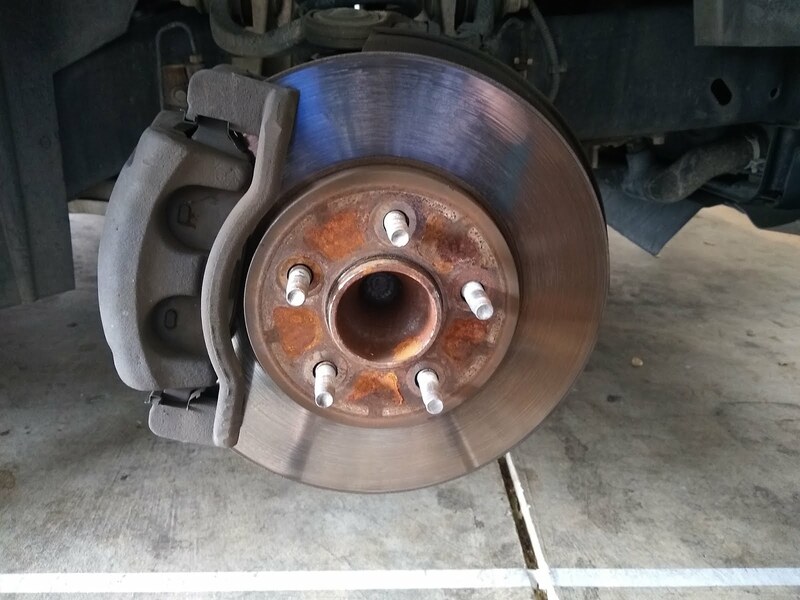 This must be the cause of the vibration I experience when I've been braking. Onto the 18mm bolts holding the caliper bracket in place. Neither moved. I tried for half an hour and no luck. 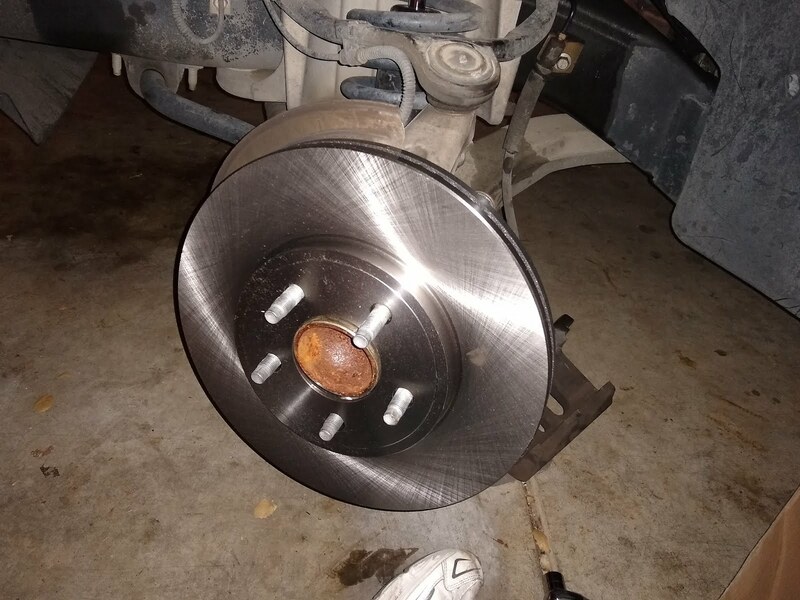 I was about ready to give up on this project, but I decided to see if the other wheel would be easier to do. And as fate would have it, exactly the same things happened to me with that wheel too. I would have to purchase a second pair of slide pins. Fantastic. 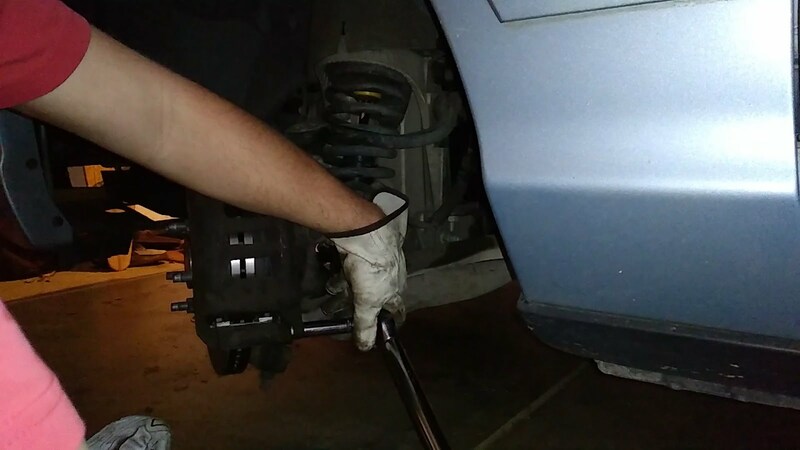 And the bracket bolts weren't coming loose either. Great. 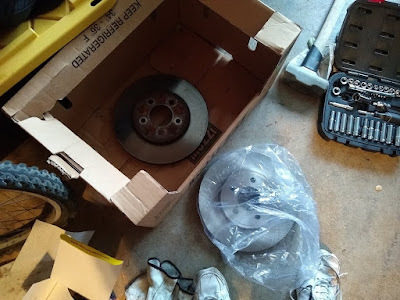 At this point I thought to myself that I bought those rotors for nothing. Oh, and I ended up breaking my 18mm socket at this point too. 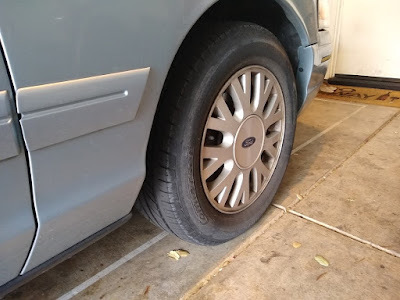 My local AutoZone only had one pair of the slide pins in stock, so I decided to go grab them as I wouldn't be able to put my calipers in place to park my car for the night. 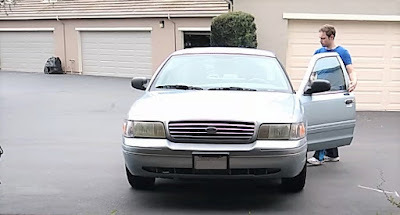 Luckily I have that second car, so I didn't need to worry about needing the Crown Vic. 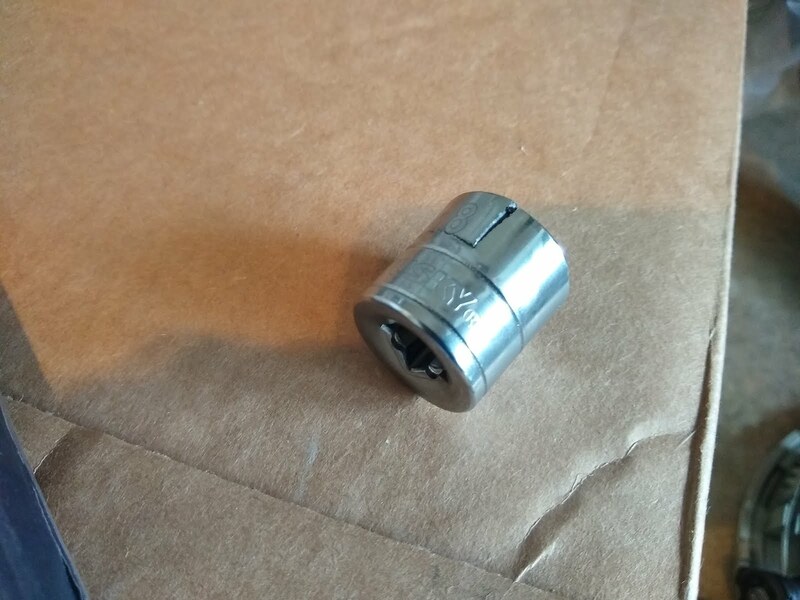 I picked up the first pair of slide pins and placed an order for a second pair, which would arrive the next day. I also took the opportunity to run to the Home Depot to cash out on the unlimited lifetime warranty on that socket. Back at the house, I was able to secure both calipers in place with the new pads with just one slide pin holding each caliper in place. I wasn't driving that car anywhere, expect a few feet backwards and forwards to park it in the garage for the night. With the wheels back on, I got the car parked for the night and called it a day. This brake job would have to wait until tomorrow. I felt so demoralized. 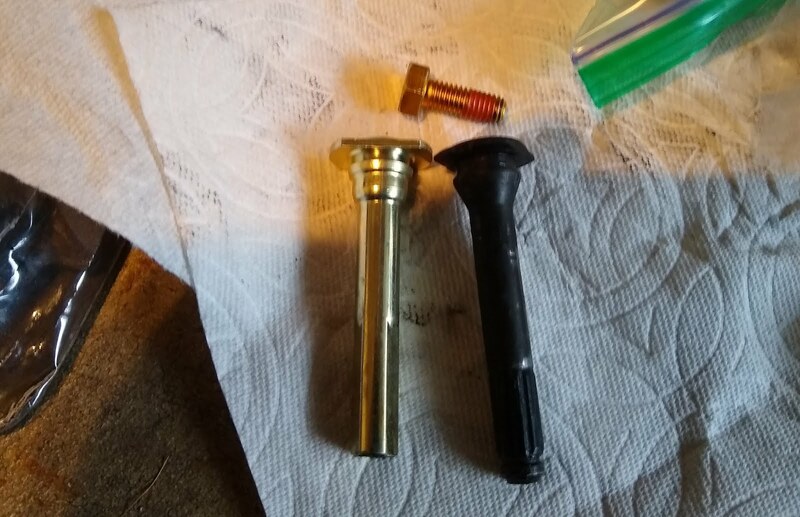 I spent some time watching some vids online on how best to remove those bracket bolts. 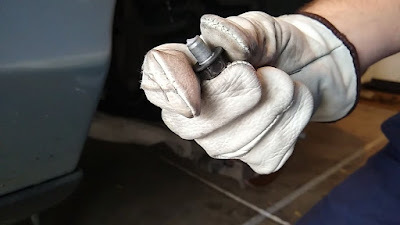 Browsing through the comment section of one of ChrisFix's brake job tips videos, I stumbled upon a comment that while it seems like common sense, made me think twice about what I had attempted that day. The next day I called AutoZone first thing to see if they had gotten their shipment in, but they told me it wouldn't be until later in the afternoon. Great. Well at least I got to take advantage of the bright and sunny day before then. Once the parts were in, I made it to the store and snagged them. Time for some redemption! Luckily I had all the lug nuts loosened up from yesterday's experience so those came off without any trouble. 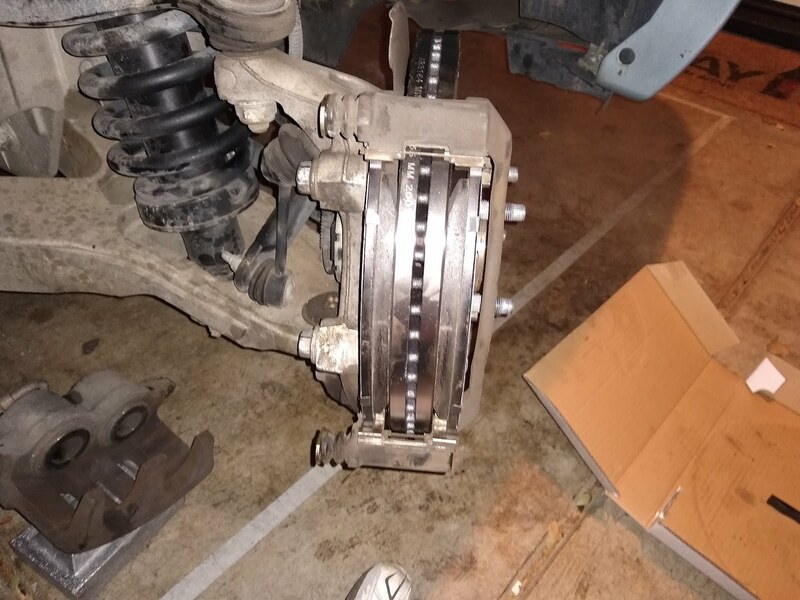 I got the calipers off and then started working at the caliper bolts. What do you know? Those bolts actually move if you turn the wrench the correct direction! Success! Caliper bracket #1 pulled and the first new rotor is installed. The new slide pin and bolt went on without any trouble either and I torqued those down to 30ft-lbs. Onto the second wheel, and I had similar success here, rotor #2 installed. Time to tighten down the new slide pin bolts. Hey I have an idea, I may as well rotate my tires since I have this torque wrench. This will be as simple as throwing the spare tire on the front wheel, and swapping the two wheels around. Luckily that didn't happen and the tire rotation was complete. Now it was time to pump those brakes and test drive! In case you want to follow along my alternative Instagram account, it's @vinnysvic. 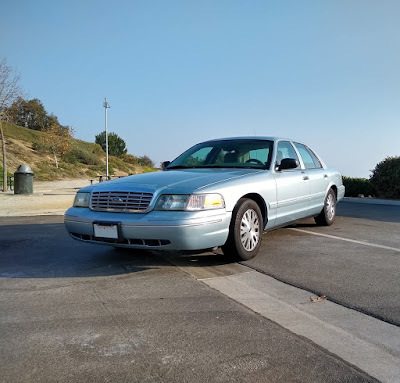 I dump all my car photos there, so check it out! 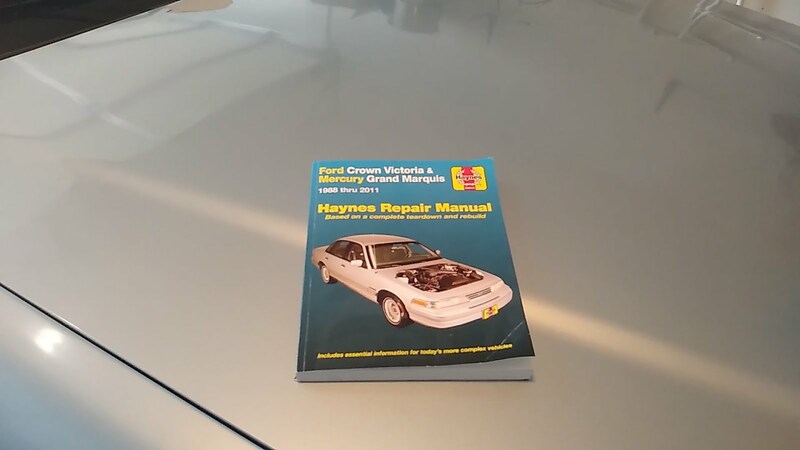 Also, I recommend investing in a Haynes manual if you're going to try wrenching on your car. Here's a link to the one I use for the Crown Vic. 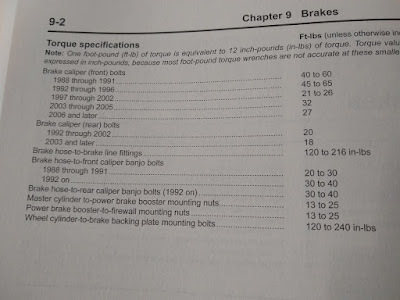 It contains some useful information, such as the factory torque specs for nearly all the bolts in the vehicle.